With the largest pool of promising talent to ever vie for a spot on the U.S. Endurance Team, there may never be a better opportunity for the U.S. to win the team gold medal at a world endurance championship than now. the process of picking the best of the best has been a two-year effort. The selection process began following the 2008 World Endurance Championship in Malaysia, when Chef d’Equipe Becky Hart of San Juan Bautista, Ca., a three-time world champion with extensive team management experience, was hired to build the 2010 WEG endurance team. She developed a plan to cultivate accomplished endurance riders who had never competed at the Federation Equestre Internationale (FEI) level. Hart succeeded in building a deep list of qualified riders by providing training, coaching, mentoring and—most importantly—a clear understanding that, unlike national-level competition, endurance at the international level is a team sport. By the time the qualification period closed, Hart had approximately 45 nominees. Those riders then competed in one of three selection trials held in June, July and August. Following the trials, a select number of riders were invited to participate in a final observation trial. From this group, 12 riders were selected to go on to Kentucky to train for a month. Finally, after a final round of examinations one week before race day, the United States Equestrian Federation (USEF) announced four team members, one individual rider and one alternate. Hart, a four-member selection committee and Team Veterinarian Jim Bryant, D.V.M. are responsible for selecting the team. “We are evaluating the quality of the horse, the quality of the rider, the record of the horse and record of the rider,” explains Roger Yohe of Georgetown, Calif., who is chairman of the selection committee. “We are looking at the ability of the horse and rider to ride to prescribed parameters, to follow orders and to demonstrate teamwork,” he says. Meg Sleeper, DVM, a veterinary cardiologist at the University of Pennsylvania Veterinary School, is an experienced FEI competitor on the nominated list with three horses. Syrocco Reveille was Sleeper’s mount at the 2008 World Endurance Championships, and she and Syrocco Harmony were on the gold-medal team at the Kentucky Cup. 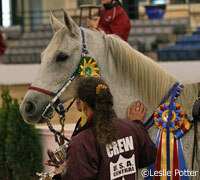 Sleeper’s third nominated horse, Syrocco Gabriel, won the CEI*** Vermont 100 in 2009. Sleeper and Syrocco Harmony will be on the U.S. team. The husband-and-wife team of Heather and Jeremy Reynolds of Reynolds Racing in San Jose, Calif., both made the long list. Between the two of them, they have considerable international experience at the world championship level. Jeremy’s nominated horse, Sir Smith, has won three CEI*** 100-mile races and in February competed at the President’s Cup in Abu Dhabi, United Arab Emirates, where he was the first foreign horse to finish the race. 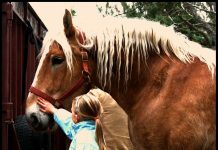 Heather and her horse Ssamiam have also been named to the team. Among the newcomers on the long list of riders is Lindsay Graham of Napa, Calif., who graduated from the U.C. Davis Veterinary School in June. “At the end of the 2008 endurance season I began riding a horse owned by Chris Martin of Grass Valley, Calif.,” Graham says. “Chris needed a jockey to campaign his horse at the international level. 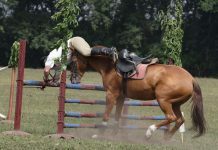 Monk has proven to be a spectacular athlete with a 100 percent completion rate, a first-place finish and best condition at the 2009 (American Endurance Ride Conference) 100-mile National Championships and a second-place finish and best condition at a 100-mile CEI *** ride. The talent that this horse possesses is beyond what I have ever experienced I am looking forward to what lies ahead.” Graham and Monk will be competing for the U.S. as an individual entry. The remainder of the team includes Ellen Rapp and Berjo Smokey, and Janice Worthington with Golden Lightning. Worthington, 70, is the oldest competitor on the U.S. teams for this year’s World Equestrian Games.